June 6, 2014, filed under 'PEACE PICKET', 'POP UP' Camps, PRASRA 2011, SYRIA; No Comments. 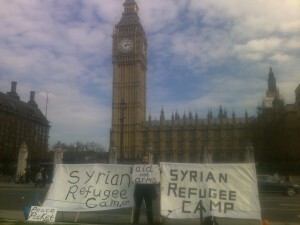 Show solidarity to the Syrian people and support the 3rd ‘POP UP’ Syrian Refugee Camp. 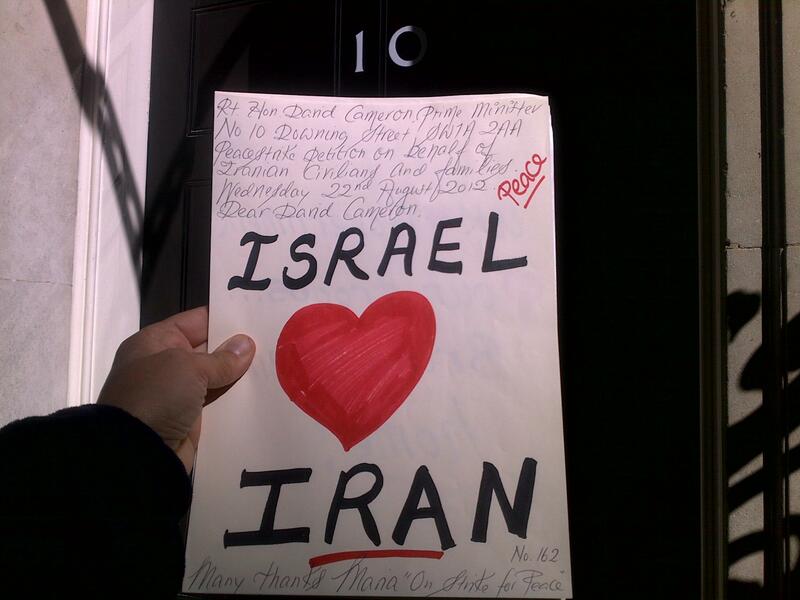 November 26, 2012, filed under vigil for Iran; 2 Comments. 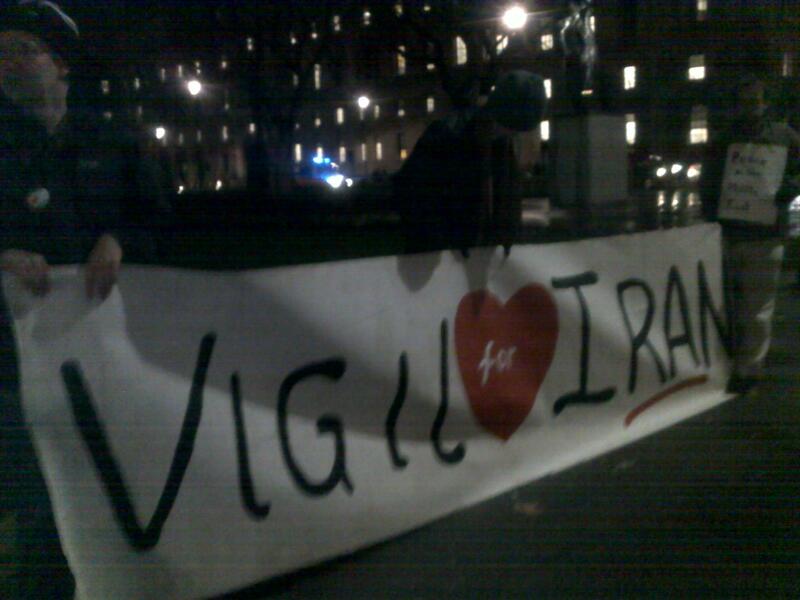 This photo is of last weeks “Vigil for Iran” dated 21st November’12, held at Parliament Square UK. Due to heavy commitments at this moment, and also the fact that there is little support for this vigil at this time, we have decided to postpone the vigil until sometime in the New Year. We will post again on the vigil as things change. Our daily petitions to Downing street will continue. Many thanks Peace Strike. 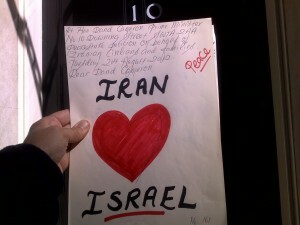 November 5, 2012, filed under PETITION, vigil for Iran; 1 Comment. October 23, 2012, filed under vigil for Iran; 8 Comments. 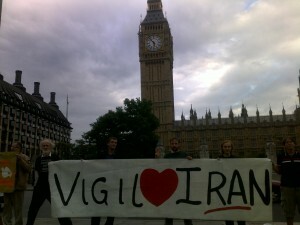 On-going weekly vigil, Wednesdays 5-7pm Parliament Square London UK. Need to spread nationally and internationally. Peace is an on-going struggle which requires effort and diligence. To fail in our efforts means unbearable mental and physical suffering for so many. IF WE ARE ABLE TO DO SOMETHING TO HELP – THEN WE MUST! Are Iran sanctions working? 22nd Oct 2012. September 24, 2012, filed under PETITION, vigil for Iran; 1 Comment. 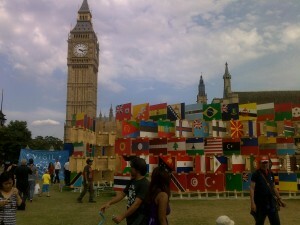 Initially every Wednesday from Parliament Square 5-7pm. September 13, 2012, filed under vigil for Iran; 2 Comments. “VIGIL FOR IRAN” 12th September 2012. September 10, 2012, filed under vigil for Iran; No Comments. 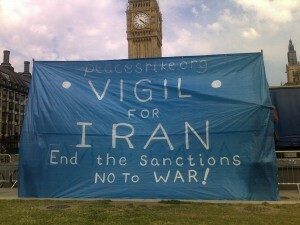 Let this be the start of an international movement to prevent war with Iran. Prevention is better than a cure,There has been no peace made in Afghanistan or Iraq, just endless killing and suffering.We have got to end this madness! Lets make a new start now! Join us at the Square or support in solidarity. 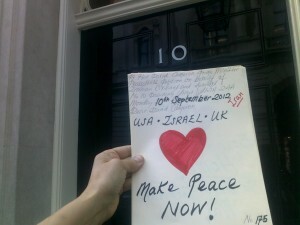 Photo: Petition to No 10 Downing Street. Peace for Iran, peace for Israel, Peace for the World! 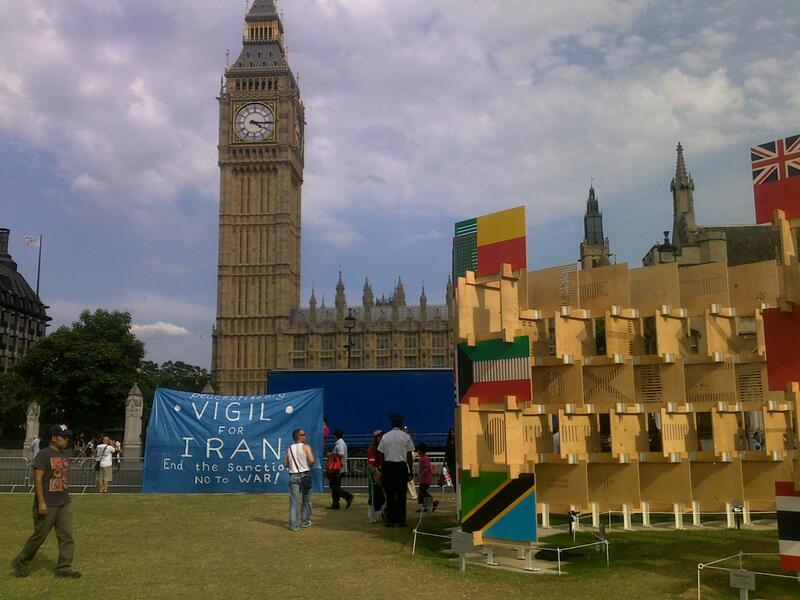 August 24, 2012, filed under PETITION, vigil for Iran; No Comments. END THE SANCTIONS – NO TO WAR! 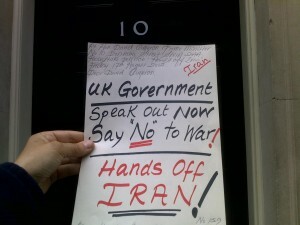 Only the people organizing and speaking out NOW can prevent war with Iran. We must plan ahead in case of an emergency. Now is the time for people to unite in peace for the greater good of all people. We have no time to loose. The window of opportunity is still open. We must organize now so that we can and will be effective in our campaign. 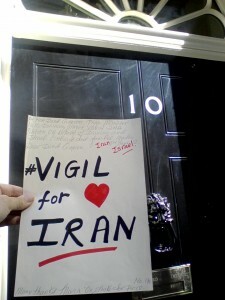 The ‘Vigil for Iran’ will be held outside the British Parliament and will represent ordinary grass roots campaigners, concerned citizens, the washed and the unwashed….in other words everyone who has care and compassion and will allow themselves to stand up and be counted. It will be a peaceful vigil with the aim of promoting peace through peaceful action. 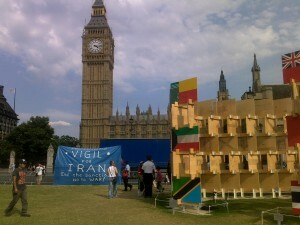 The aim of the vigil is to grow in size each week and to spread to other strategic areas. 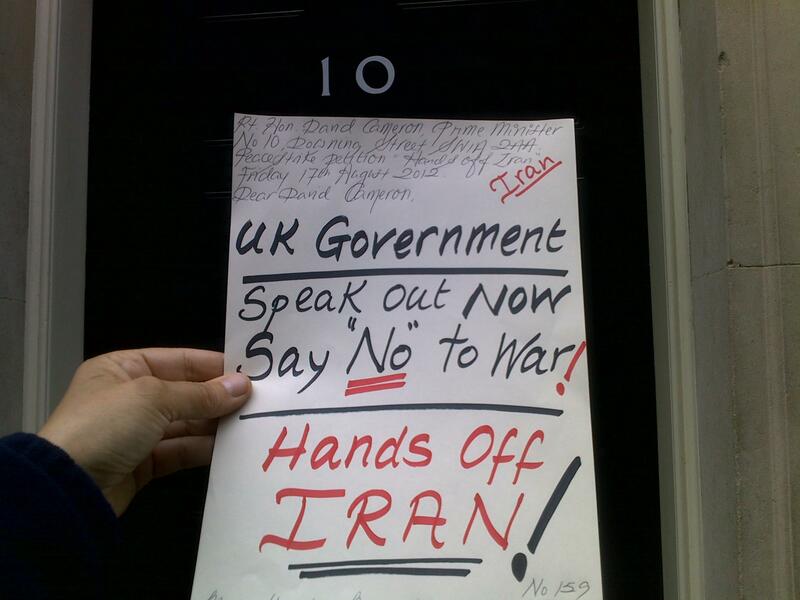 PRE-EMPTIVE ACTION TO PREVENT WAR……. Good people coming together to do something. August 13, 2012, filed under vigil for Iran; 3 Comments. WE NEED OUR TROOPS HOME! We must plan ahead in case of an emergency.Now is the time for people to unite in peace for the greater good of the people and our beautiful world. We have no time to loose. The window of opportunity is still open. We must organize now so that we will be effective. The Vigil for Iran will be held outside the British Parliament and will represent ordinary grass roots campaigners, concerned citizens, the washed and the unwashed….in other words everyone who has care and compassion and will allow themselves to stand up and be counted. It will be a peaceful vigil with the aim of promoting peace through peaceful action. 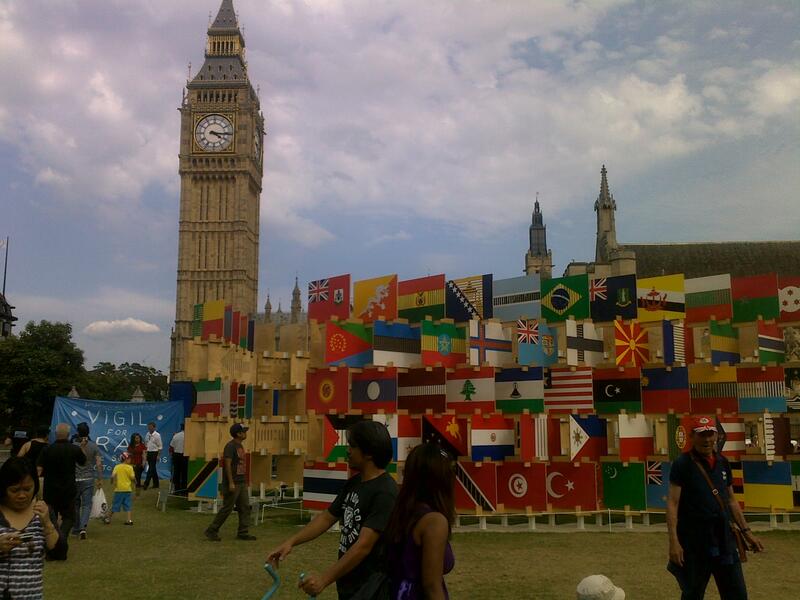 It is not illegal to peacefully demonstrate in Parliament Square , Westminster, or Whitehall. Indeed it is encouraged. With the demise of the Serious Organized Crime and Police ACT 2005, (concerning demonstration in the SOCPA area), the restrictions that have replaced SOCPA 2005 apply to the use of camping or sleeping equipment. There is a case going through the court challenging this issue. The Public Order Act 1986 would now come into effect. All are very welcome to join the vigil. The starting date will be announced soon….. The Vigil will initially be held once a week and will gradually build up.